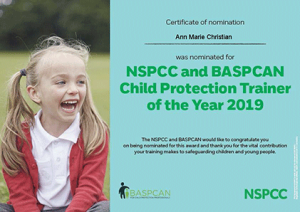 Since 2010 Ann Marie has independently supported hundreds of organisations in strengthening their safeguarding agenda. She wrote a chapter in a social work book ‘Becoming a Social Worker, Routledge, Viv.E Cree, 2003 and was encouraged to continue writing as she has a natural skill in simplifying a difficult topic in but in a provoking style. She’s been delivering keynote speeches and workshops at national conferences since 2001. She participated in a pilot project in 1999 as a social worker based in a school in an Inclusion Team. It was a successful project and the exclusion rate reduced by a third in the first term. The project received Beacon Status and was invited to various conferences to talk. Ann Marie is the safeguarding officer for her local parish and delivers annual training to the volunteers. She sits on the church Safeguarding Committee who meet quarterly. She is a big child at heart and loves reading children’s books and writes monthly reviews for Letter Box Library. 1. How did you meet or hear of Ann Marie? We met Ann Marie at a Safeguarding Conference in London where Ann Marie was one of the speakers. 2.Why did you book her after meeting her for the first time? We booked Ann Marie initially to complete a Safeguarding/Child Protection Audit at my school, as we thought she was very knowledgeable, interesting & liked her approach. 3.How has her input changed your knowledge and setting? After Ann Marie’s very thorough & professional Safeguarding/Child Protection Audit at my school which including a comprehensive report & on-going support, we implemented all of her recommendations, which has made my school’s Safeguarding/Child Protection procedures more robust, especially in light of all of the recent guidance changes/updates. Since the audit we have used Ann Marie on further occasions to lead staff training including Leadership/Designated Safeguarding Lead (DSL) training. We will continue to work with Ann Marie moving forward. 4.Would you recommend her and why? We would definitely recommend Ann Marie. She is….. knowledgeable – experienced – current – approachable – helpful – professional – supportive – empathetic – good value for money.